Are you moody and searching for tools with which to handle those troublesome ups and downs of life? 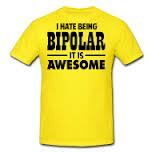 Whether or not you are diagnosed as bipolar, this group may be useful for you! Sessions led by trained Counselor/Art Therapist, L. Carlile, Ph.D.